where we were present with our bags of Natuurkompost. 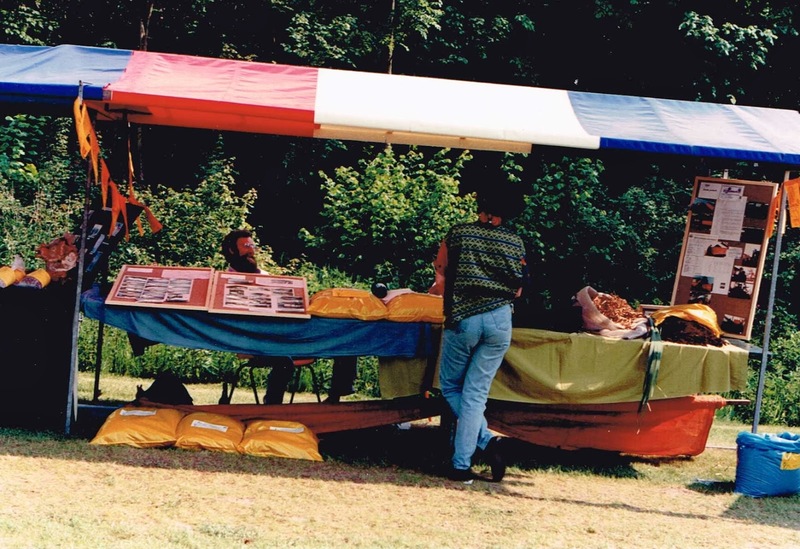 Our work started in the Netherlands, when we could rent a house in the country from a friend. When Hendrik was dismissed as a swimming teacher we started a goat farm. We made goat cheese and started a vegetable garden. We did not know much about gardening, but the cheese sold reasonably well. The manure from the goats we could use well for the vegetable garden. There were new goats each year and the amount of manure grew. All what we did, we built on progressive insight. And this way of working has brought us a lot of good. Here we also started our first composting. To begin with, one reads a book. 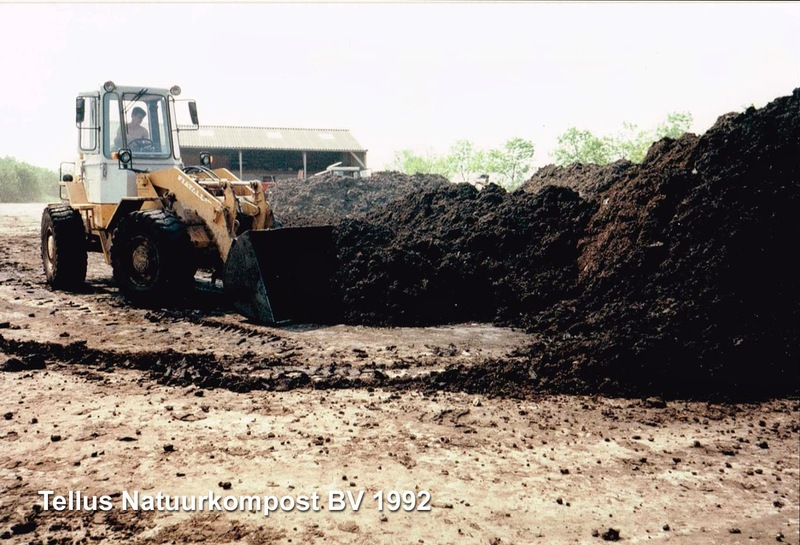 Within the mainstream agriculture, we did not find much recent literature about composting. However, in the 'dynamic biological agriculture' we found even more treatises on compost. The concept of 'Eco' (ecological agriculture) we did not know then. That had yet to be invented. At the same time, we knew the Rudolf Steiner movement, which dates from about 1930. The year that Rudolf Steiner gave a lecture on anthroposophy. So then there was this book about anthroposophy and gardening. There were books on organic gardening; gardening without spading, gardening without poison etc. And they all covered gardening with compost. Organic gardening was the alternative hype of the seventies. At that time we called it 'biological gardening'. And it provided all very interesting literature that had kept Hendrik busy for long evenings. Our first compost pile was built with garden waste, kitchen waste and whatever organic matter we could find. According to the book 'Gardening without Poison' written by Alwin Seifert, we should cover big layers of organic material with a thin (pink thick) layer of soil. We followed the instructions securely. How pleased and proud we were about our pile! We showed it to every visitor and philosophized about what a beautiful compost we would get and what we all would be able to do with it. Hendrik: "According to the book, we had to wait three months before we were allowed to touch the pile. Those three months lasted long. But then there was the day that it should be and then the spade went in. What a disappointment that was. The pile inside looked just as if I had set it up the first day. Nothing, but nothing was composted there. Not any bacteria had bothered to undertake even a start. Each thick layer of organic material I had covered with a thin layer of soil... and that soil had sealed all organic matter from air and water. In doing so it preserved the organics. If we had left the pile untouched for much longer, maybe a year, there had been happened something obviously. Then there indeed had originated bacterial activity and the pile had composted by the influence of rain, earthworms etc... Perhaps. I then made this pile very wet and turned it up side down as much as possible. This all finally had become compost, but my disappointment about this event has remained until this day. It made me look for answers." Later, after this great debacle, we managed to convert manure and organic materials into a very reasonable compost. We made a thriving vegetable garden and it was a lush for the eye. Later we came to the conclusion that it was the goat manure, which guaranteed the quality of our compost. What we were doing actually was capturing fertilizer (available in the manure) in organic material, with which we multiplied the volume of our (Dutch) soil. Later this knowledge came very handy. The 80s. 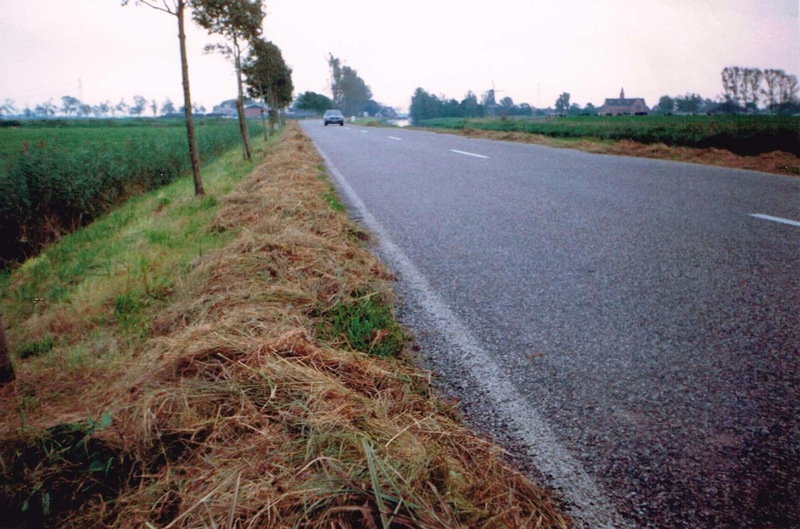 Governmental organizations cut down verges and lands. 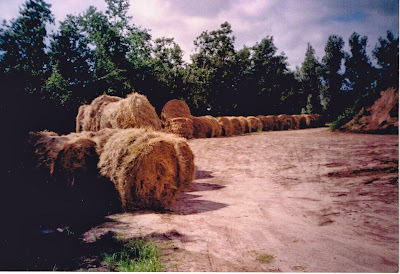 The hay usually went to the landfill. When our friend wanted to sell his house, we moved to a house without land in a neighboring village. We were a bit sorry about this, because 'living in the country' had now become a part of us. But we had three children and in the village the school was close by. Hendrik and some of our friends got unemployed and we developed an agricultural plan together, in theory. We set up a foundation in order to organize the plan and to realize employment for all its members when the project was realized. Within the theoretical concept of our plan we missed some organic matter. We could not get the cycle complete. We calculated enough manure, so we had enough fertilizer for composting. But we needed more organics to increase the fertilizing volume, in order to guarantee a proper horticulture and agriculture production. Which was of course, at that time, a quite remarkable fact to think about. We had been working on it for a while and we came to the conclusion that we probably needed some more area for hay-making. We learned on our goat farm, that with manure one can convert a lot of organic material into a good fertilizing and soil enriching compost. And so we decided to look for an opportunity to attract organics from other sources. And then you start talking to people. While the foundation ran down, while we were down to three people, we were already in the middle of several (informal) conversations with a few government agencies, just to see what the possibilities were to gather organic materials for composting, within our theoretical farming concept. And so we were faced with diverse interests, entirely different than ours. is waiting for transport to our compost project. In the Netherlands, there are government agencies, such as the Provincial Water Management (Waterstaat; maintenance of roads and water) and the Forestry Commission (Staatsbosbeheer; nature maintenance), which manage greens along the roads and large areas of land in natural parks. They mow the grasses each year and carry them off to the landfill. So now they offered us to compost these grasses. We were able to rent a property, to start a project on our own account and (if successful) to be continued, as long as we wanted. We had to say goodbye to the agricultural plan. Hendrik and I have considered this proposal and we decided to take the chance. 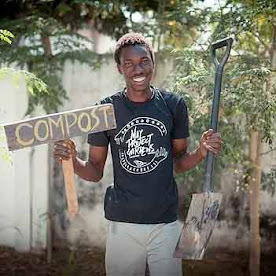 Hendrik started the composting project, along with a good friend. Many mornings they both biked to the site to do testing and building installations. I myself have restricted myself to the conduct of the administration and writing to funds for financing. Hendrik: "In addition to the books on organic farming, I also had access to older books relating to traditional agriculture. These I had received from my stepfather. It had once been his study of high school in the 4ties of the last century. Between these books, I found the book 'Microbiology of the field and the agricultural products'. At that moment I could not comprehend the value of that information. It occurred to me later, when I had to deal with it intensively. So the most basic knowledge of soil microbiology was the basis of our future business structure." We learned a lot about the composting of grasses, from practice to theory and vice versa. We studied the microbiology of the soil, the manure and the compost. We did tests and concluded that we could scale up using our, already very largely developed, composting method. And we knew how to cope with the Dutch, often wet, weather conditions. In the end, all of this lead to the establishment of a private company: Tellus Natuurkompost BV, with Hendrik as a technical director and me as a financial director. Later I became general director. Three years after the founding of the company, Hendrik became ill. Something that worsened insurmountable in the course of the year after. He was forced to lay down his work, which cost him a lot of headaches. 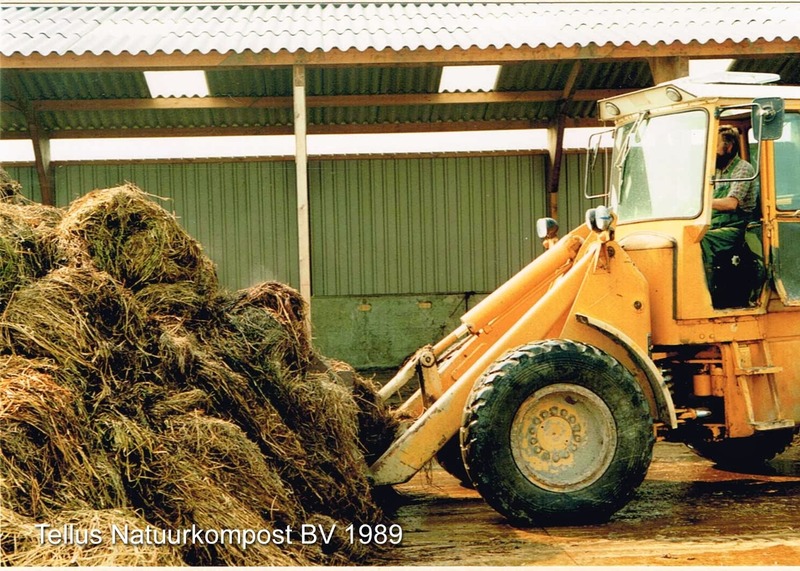 We sold the company to the VAM (Vuil Afvoer Maatschappij), the obvious partner in the field of composting. But with a completely different corporate culture. After a year I said goodbye to the VAM. As far as we can tell, there is not much left of our original design. The buyer could earn his money in a different way. But our knowledge remained. Grasses from extensive, seemingly unusable areas can be used for the composting of an effective soil improvar. Savannas, prairies, pampas and/or pustas supply grasses that can be used for the production of food. By mowing the crop and transporting it to a closed composting system, one can compost CO2 negatively. By means of good grassland management, with fallow land and a correct mowing policy, the fires that can arise spontaneously in savannas and prairies can be made manageable. This gives a completely different view of the upcoming food problem. And technically it is very well possible. Hendrik: "What I find so exciting about composting? We know that everything around us is full of bacterial life. If I start a compost pile, I inoculated with grafting fluid, of which I think is full of bacteria, that is functional for composting. Within all that hay, very many bacteria must be present, although I cannot see it. 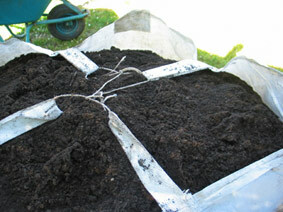 Now I make small amounts of compost in barrels and big bags. I graft my hay in 1 immersion barrel, drain it in 2 dripping barrels and store it, until I have 5 barrels full. In these last 5 barrels the multiplication of bacteria begins. In total it remains about a week in the store and then I put all of it in a big bag. After three days heating (scalding) already starts. This composting process allows us to change organic material, that we cannot eat, into grown food that we can eat. To make this metamorphosis possible, by applying some knowledge and some patience, this fascinates me hugely still. That is why I think composting is so exciting. Still now; now having been working on this for at least 40 years." About composting grasses. How I do it. compost is not a fertilizer. It is a precondition for soil activity. Why immerse materials before composting? "What I want is to wet the material in such way, that the bacteria are able to get a 'grip' on the hay. Good grip on both the waxy layer of the plant as well on the pile itself..."
The great immersion barrel picture show! ...in images. How a blade of grass gave birth to a been... A fairy tale that tells us what is going on in a compost pile. Microbiology for dummies. About cellulose, C/N numbers and digestibility. This hay is great stuff for composting! About volume, organic matter and manure. Principles and some food for techies. Hendrik: "The immersion barrel (grafting barrel) is the most important part of my composting method. So that will be my main focus here also. Besides we need a place to drip and a place for temporarily storing, before the actual composting begins." A post about the 'cold-manure-preparation' or 'noble-manure' in the words of Dr. Ir. F.C. Gerretsen and an overview of our composting method. About a natural force, or the force of nature that is greater than us. 2017 - how mulch saved our garden! From the Past and the Present We started in the seventies and had a company in the eighties and nineties. About Hestel Tellus... who we are. On an Alentejo Monte in 2011. How we started composting and gardening on this typical Alentejo Monte. "Gardening without Poison." by Alwin Seifert. Germany 1971. Stone Dust, Stardust. We have to change our mindset about the nature of the fertility of our topsoil. The volcano which should erupt. In fact, we can better skip this time of chemical fertilizers and pesticides, as a catastrophic mistake. Soil for brains. About dirty hands and clean soil. How we use our compost - Part 1. How we use our compost - Part 2. How we use our compost - Part 3. Finally a good solution for the composting of garden and kitchen waste. September 2016. January and July 2017. Our compost storage. February 2016. About structure and mixing. Rich in oxygen and oxygen poor September 2015. Summer. August 2014... the nutrients the fungi have captured come but difficult at the disposal of the soil. A new Season. June 2014. About grasses and hay. Water and Soil Activity. June 2014. Experiences with compost in raised beds and pots. Numbers and what is behind it. March 2014. About simplicity and how to get there. And more news from 2017. Seeds and species - Cabbage. Seeds and species - Zucchini. Summer 2016. About mail or female. The reason we liked a roof over the garden. Sum Melon and Heat Stress. The garden in August 2016. Amazing harvest already! June 2016. Cabbages and potatoes. Harvest-Beetroot. October 2015. And a recipe. For our daily 'Haute Cuisine' ! Clean drinking water from sea water! "Miracle needed to end drought"
Conventional farming does not feed the world now An article from 10 years ago. And still as relevant as if it was written today. A bad sign...? EM on your garden? No... not for us. Flight Behaviour. Must we go to Mars to save the world?? The White House will now have a 'permanent' kitchen garden. "This innovative education model gets kids rapping, planting, and cooking in marginalized neighborhoods of London." Can one compost Jacobs Ragwort? the Composer moved to the Guitar Composer - hendrikvanrijn.blogspot.pt has moved to hendrikcomposer.blogspot.pt So please follow by a click :) * Hendrik. Hestel Tellus - Hendrik van Rijn & Stella Andrea . Thema Supercool. Mogelijk gemaakt door Blogger.